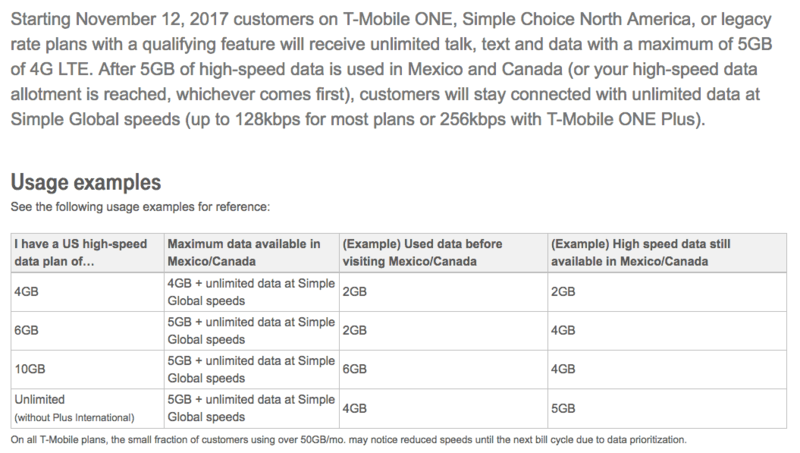 T-Mobile announced a few days ago that the unlimited benefit available while roaming in Canada and Mexico is changing significantly. There are two main changes – the overall monthly data allowance has shrunk considerably, and the speeds have been dropped from LTE to 3G once you hit that limit. This is a major about-face on the feature itself, which was highly touted when the T-Mobile One Plan was rolled out a year or so ago. I switched all of my personal lines, including the dedicated LTE connection Grace, to T-Mobile because of the T-Mobile One benefits. My main reasons for switching was cost, the improved LTE speeds and coverage around the Salish Sea and in the San Juan Islands, as well as the much higher data allowances than AT&T and Verizon. Roaming while in Canada was a secondary reason, but I still considered it when switching, and used it this last year when up in the islands and closer to Canadian towers. I had used Verizon and AT&T for years prior to switching to T-Mobile. With AT&T, I had a group plan that allowed 30GB of data transfer per month for all lines, including 3 iPhones and the boat, for around $300. We routinely went past the 30GB limit, as we are heavy mobile users, and were penalized with overage charges for every additional 1GB of data transfer. Some months our bill was in excess of $600, and traveling to Canada, which is the most likely location for us to visit internationally, costs even more. Verizon’s costs were similar if not higher. Coverage has been an issue with T-Mobile in the past, but after using AT&T & Verizon for the previous 5 years, coverage was becoming less of an issue, and speed started becoming a bigger issue. Almost everyone I knew had personal phones on T-Mobile, and after playing around with several of them, I was really impressed with the throughput and speed. Coverage had also improved throughout the San Juans and also around the Salish Sea, which made the decision much easier. Then T-Mobile came out with the One plans, offering 2 lines for ~$120 with “unlimited” data, international coverage, special international speeds and unlimited data in Canada/Mexico and a host of other things. I switched soon after, and have been very happy with the service. When I’m out on the water, I can’t really see much of a difference between AT&T, Verizon, and T-Mobile in the Salish Sea and San Juans. I know once you get out further away from things that it could be more of an issue. In dense metro areas, such as Seattle, coverage can sometimes be a challenge in high rises and buildings, but that is where WiFi calling fits in, and I actually prefer it when at home and work. Sam, Kevin, and Laura over at Slowboat.com made an epic journey up to Alaska this year, and I suspect they used a decent amount of T-Mobile bandwidth where available, although it sounds like in discussions with them that AT&T worked better in the boonies. The “unlimited” data is the biggest benefit of the One plans. It’s not truly unlimited, which is in-line with every other carrier who has offered these mis-labeled plans recently. Instead, you get ~50GB of high speed LTE data per line (up from 28GB recently – read more at RV Mobile Internet Resource center), and once you reach that amount, T-Mobile can slow that line down to 3G speeds in congested areas. In less congested areas, I would assume you could continue consuming high speed data. But the bigger point is that they don’t charge you for data overages! You can continue past 50GB, albeit at slower speeds, without incurring a huge bill. So not only did I go from $300 to $180 (I have more lines than the 2 promo), but I don’t have to worry about going over a bandwidth cap and getting a massive bill when someone decides to watch Netflix and falls asleep overnight. With my Peplink MAX Transit router, I could also put bandwidth limits in place and have it switch to a different SIM card for the remainder of the month to ensure high speed data. 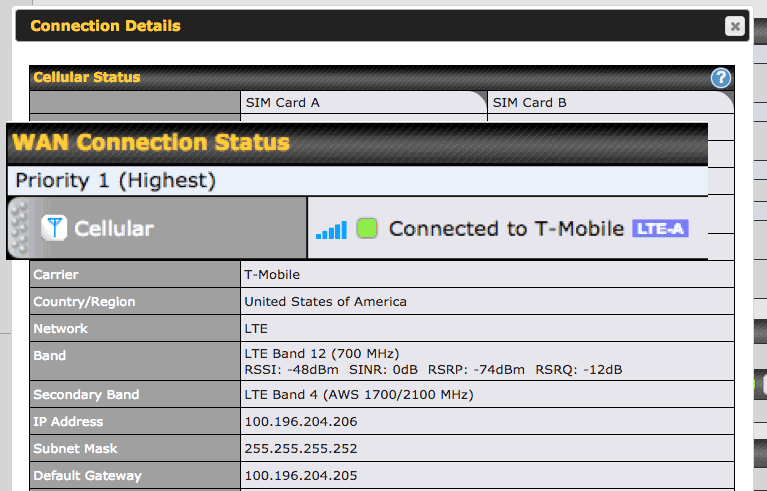 For T-Mobile One, once you hit that 5GB cap, you’ll be slowed to 128kbps, and T-Mobile One Plus slows to 256kbps. These speeds will still allow you to do things like email, browse the web (slowly) and do other general things. Streaming video and other more intensive stuff will be very slow, if not impossible. Turning off automatic cloud-syncing stuff and using your phones data/roaming limiting software will help. It’s still manageable, and I am glad it was not eliminated completely, but it is a change you need to plan for. For those on T-Mobile One Plus International, which is an extra $25 per month, and what I use on Grace, we remain the same as before, as far as I can tell – LTE speeds when in Canada/Mexico and “unlimited” bandwidth, which equates to the 50GB of data/month/line and then reduced speeds in congested areas. I wonder how long that will last, though. T-Mobile says: In order to prevent usage beyond the intent of the product, we implemented a limit on the amount of monthly 4G LTE data. Less than 1 percent of people with this benefit travel to Mexico and Canada use over 5GB a month. I find that percentage to be quite low, as I know lots of people who routinely travel to either location, are heavy mobile users, and likely burn through 5GB because they’re not sitting in a hotel or at a business using WiFi – they’re out on vacation or enjoying life, posting videos and photos, and using mobile data. I would assume most people have similar use patterns, not just people I know. I am sure T-Mobile has to pay the roaming carrier for your usage on their network, and I suspect it was a more popular feature than originally expected, and those costs were rising. I’m glad you can still have free data and coverage in Canada/Mexico, but this change will undoubtedly cause problems for some people who take longer voyages – 5GB is not that much for a whole month. T-Mobile still remains the best provider, in my opinion, for the US/Canada/Mexico, as they do not charge for overages when traveling those areas. The one bright spot is the recent change to the data cap of 28GB, moving up to 50GB, which is nice to have the additional headroom per month. I still love them because of their network speeds, free stuff, and in general more sensible approach to a service that we all use and need in today’s connected world.